Order the aluminum louvered vents shown here in your choice of a painted white, brown or black finish. These decorative registers are made from a solid aluminum which will not rust. They can also be left unpainted and will have a classic chrome look. The aluminum louvered vents are meant to be used in wall or ceiling applications and will come with mounting screws. This decorative register features an Arts and Crafts era design with vertical and horizontal line patterns. Each of the aluminum louvered vents will have a steel damper on the back which adjusts open or close. Classic Grilles decorative registers are all made in the US by hand, ensuring you quality craftsmanship. 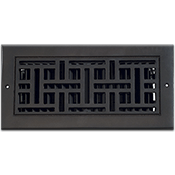 These aluminum louvered vents are sand cast to have a 1/4" thick faceplate to give it a old time feel. Use these decorative registers in your home to replace worn out and outdated white steel vents and see the beautiful change it makes! Tip: These aluminum louvered vents are listed according to your hole opening measurements. The 14 x 14 decorative register will fit into a hole which measures 14 x 14 inches. The outer border will have additional 2 inches for easy installation. Final aluminum louvered vents measurements may vary since each vent is hand made. Important: Our decorative registers are made to order and are considered special, non returnable items which cannot be canceled once order has been placed.. Allow 7 to 9 weeks for them to be made and shipped. Find the Arts and Crafts aluminum louvered vents to purchase with a screen backing instead of diffusing damper. Other Classic Grilles decorative registers are available for purchase to help match any style. 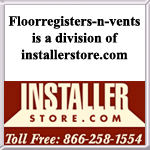 Why wait to order aluminum louvered vents for your home? Get these today and ship the entire order for one low cost.